Mark Nepo, author of Reduced to Joy and The Endless Practice, shared life lessons on Fox News' Spirited Debate with Lauren Green recently. "The greatest lesson is the challenge to reveal heaven on Earth by inhabiting our humanity to the depths of our soul," Nepo explained to Green. The way to do so is together. "No one can do it alone. We need each other," said Nepo. Mark Nepo has been part of Oprah Winfrey's The Life You Want Weekend Tour. Their next stop is November 7-8 in Seattle, WA. 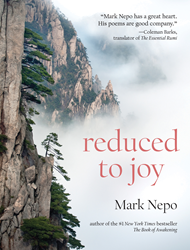 Mark Nepo is a poet and philosopher who has taught poetry and spirituality for over 30 years. A New York Times best-selling author of The Book of Awakening, he has published 13 books and recorded six CDs. Also a highly popular workshop leader, he lives in Kalamazoo, MI.